We recently unearthed a carton of KALDAR—WORLD OF ANTARES signed by artist Jon Arfstom (during his 2002 PulpCon appearance). We are making six (6) of these available at $300 (net to all) each with FREE shipping in the USA. A collection of three stories form the fragile pulp pages of Magic Carpet and Weird Tales magazines. Stuart Merrick—selected by a secret cadre of scientists–is sent on a journey to the distant world of Kaldar, planet of the Great Red Sun Antares. There, Merrick is hailed as a ruler of men—the Chan of Corla—in a world stocked with danger and adventure. Merrick must protect his city on a planet filled with treason and desire as bizarre monsters and cruel overlords threaten the safety of the humans. This first edition of Edmond Hamilton’s KALDAR—WORLD OF ANTARES, features original artwork by 1940′s Weird Tales illustrator Jon Arfstrom and a loving introduction by longtime Hamilton friend, Ray Bradbury. 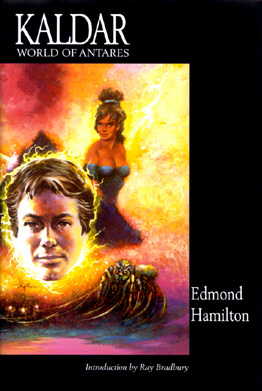 Also included is an autobiographical article by Hamilton from the January 1934 fanzine, Fantasy Magazine. Dustjacket: The first-state dustjacket for KALDAR was trimmed to the proper size but has a matte-lamination. Each copy of KALDAR was shipped without protective shrink-wrap from the printer and the black ink on the dustjacket scuffs too easily and mars the finish. The printer printed a second jacket with the proper lamination. Customers who order, or have ordered KALDAR—WORLD OF ANTARES are entitled to both states of the dustjacket for KALDAR. Contact us to see if your book was sent with each state of the dustjacket.